Site Name and Description: City & County of San Francisco Office of the Mayor is the official page of Mayor Edwin M. Lee. It includes current news, and links to press releases, priorities, a calendar, and a site search option, as well as social media links. It appears to be a bulletin board-style source of information for residents of San Francisco about what Mayor Lee is currently working on and prominently features a “Contact the Mayor” button in the upper-left quadrant. 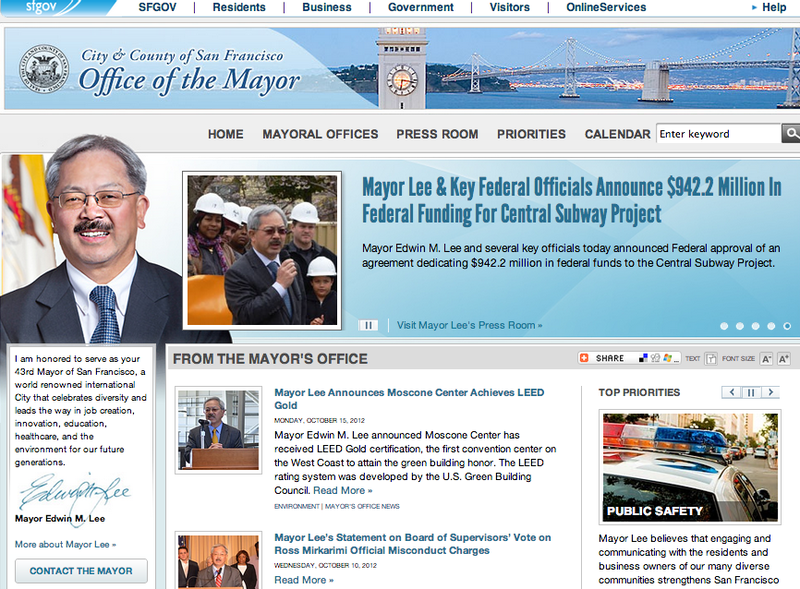 It’s a clean design and seems like a great branding vehicle for Mayor Lee, as nearly every post includes his picture. Design Overview: Crisp and sharp, the design is very straightforward, almost utterly lacking in any distractions from the key messages the Mayor is trying to convey. The sub-domain links are clearly visible, as is the option to “Contact the Mayor”. Design is clearly brand-driven (meaning the personal brand of Mayor Lee), though I think it is difficult to separate the person from the office at this level (and higher). There is good padding between elements and the site doesn’t feel crowded or overstuffed with information. No real bells and whistles, but it does have a solid social media connect area, as well as video content in the lower right quadrant. Audience: This site seems intended for an engaged resident of the City of San Francisco. It has a hyperlocal focus and does not stray at all from its intended messaging (i.e. what Mayor Lee is doing for the city of San Francisco). In addition to residents, I think it is also a good resource for city government workers to help them stay abreast of current events. Site Goals: The primary goal of this site is to deliver information via press releases, blog posts and videos to the residents of San Francisco. A secondary goal of the site might be to offer people opportunities to get to know Mayor Lee better. Social Media Integration: There is a full complement of social media connection buttons directly beneath the “Contact the Mayor” button, including Facebook, YouTube, Flickr, Twitter and Google+. There is also a Twitter stream widget beneath the social media connect buttons. There is also a social bookmark bar directly above the main content on the homepage. Technologies Used: The entire site is powered by WordPress. There is also RSS integration and a search bar tool. There is video embedded on the page, a help menu at the top and an interactive calendar with social media integration.